The fish I went home with not only stunk up my entire apartment while cooking, it also left me hugging the toilet later that night in a severe bout of food poisoning. 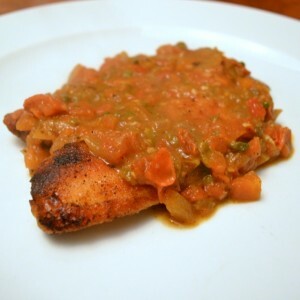 So, as you can see, tilapia and I have had a rough go of it. But tonight, this little swimmer may have redeemed itself. Of course, I did dump a good amount of wine and butter on top of it, which in my experience, can elevate just about ANYTHING. So for those of you needing a great weeknight meal and are in a tight budget, schedule or waistband, you’re welcome. 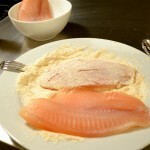 Mix flour, salt, pepper, paprika and garlic powder on a plate and dredge tilapia in it, shaking off excess. Heat 1 tablespoon of oil in a large skillet over medium-high heat and sauté filets in batches until cooked, about 4 minutes per side. 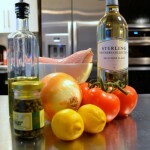 Add additional oil while cooking if needed. Transfer to a plate and cover with foil to keep warm. 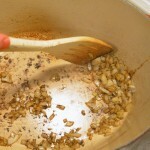 Add remaining tablespoon of olive oil to pot and stir in onions and garlic until starting to soften, about 5 minutes. 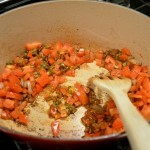 Add tomatoes and capers and sauté for another 3-4 minutes. 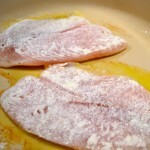 Next, pour in wine and lemon juice to pan and scrape browned bits off of bottom and sides of pan. 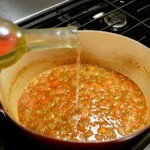 Simmer until liquid is reduced by half, stirring often, about 10-15 minutes. 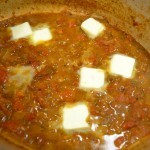 Reduce heat to low and add butter into sauce and stir slowly to incorporate only until butter melts and sauce thickens. 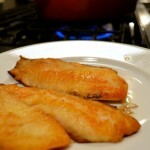 Remove from heat and spoon immediately over fish.